Use this document as a quick-start user guide to get up and running with the Online Drive, and troubleshoot common issues. A more detailed user manual is available here. 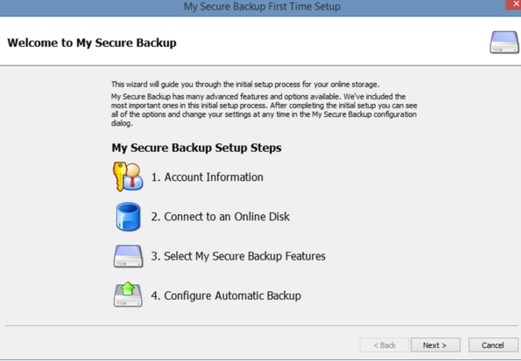 Download My Secure Backup from here. If you are unsure which Windows download file to choose, you can check on your computer by clicking on your Start button, then right-click on Computer, choose Properties. This will indicate whether you need 32 or 64 bit download file. If you are still unsure, then choose the 32 bit. Choose Run, or Save and then after download double click file to run. Tick the checkbox to accept the terms, and click Next. Click Next to accept default install directory. Click Finished when then the install completes. Click Yes to restart your computer (required to start the background network services). When the computer restarts, the Setup screens will start automatically. Account Information: enter your login details (see email), then click Next. Wait while account access is verified. Network Drive: choose a drive letter for the network drive (this can be changed later). NOTE Tourwriter users should choose the same drive letter for all staff. Click next, then click Finish to complete. The activity monitor may automatically open, you can close it for now. Open My Computer and look for you new Drive (eg S: drive). Double-click to open the drive, and use it just the same as you would any other drive, adding folders files etc. and managing them as you wish. Note that there will be a delay the first time you upload or open each folder, or file, as the data is transferred from the internet. But after this it is cached (copied) locally and will be just as fast as normal. New Tourwriter users should create a folder called TourwriterData and link Tourwriter to it (in Tourwriter go to Tools > Setup > Folder options, and browse to the new TourwriterData folder). Existing Tourwriter users can drag-drop their existing TourwriterData folder into their new online drive (note the initial sync can take a couple of hours), and then re-link it in Tourwriter (Tools > Setup > Folder options, and browse to the new TourwriterData folder). 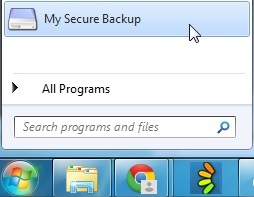 Either double-click the My Secure Backup icon in the taskbar at bottom right of your computer screen to open the Activity Monitor, or open My Secure Backup Activity Monitor and Settings from the Windows Start menu. From here you can click Configure on the top right to change settings. You can also access your online drive via this webpage (use the same login detail as for above drive).